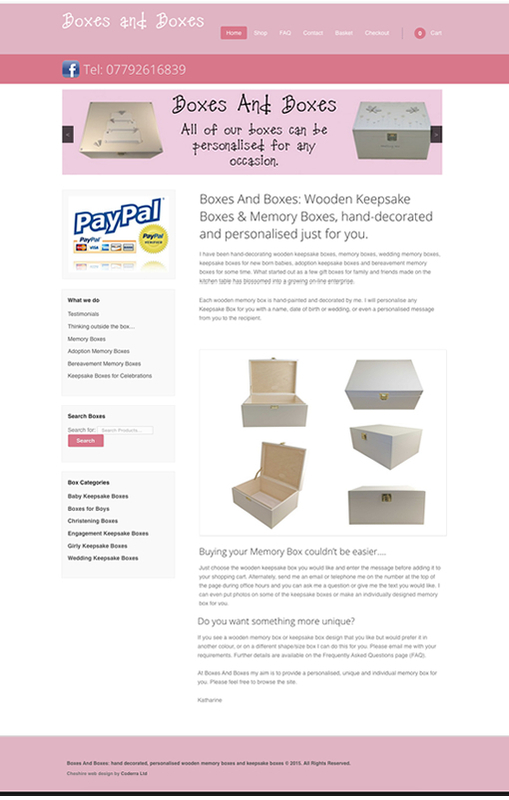 Boxes and Boxes is an ecommerce shop built on WordPress using Woocommerce for a client in Shavington. This Shavington web design used one of the standard Woocommerce themes, Appply. The client had an existing website that was plain HTML and rather hard to manage. She needed the website to be converted into a new content management system. The main purpose to redeveloping the website was to make it easier to manage and better showcase her product. Because her Shavington web design was very big we also had to carefully manage the SEO. Her older website had been running for years and had built up a good ranking in Google. There were lots of pages indexed and the site had a good level of traffic. With all redevelopment projects it’s important to make sure that if the page structure is not the same, the pages from the old site must be redirected to those on the new one. Eventually over time Google replaces these links with your new ones. So with this example, by managing the redirects from her old site we were able to maintain her existing traffic and ranking in the search engines. This Shavington web design has been branded to the preexisting colours of the old site, blending them with the colours from the logo. While this is a WordPress theme, we tweaked it to allow a great looking slider on the home page as well as the display of some of the widgets in desktop and mobile view. The aim of this Shavington web design was not to reinvent the wheel, but to stay consistent with branding and design while offering greater functionality. The ecommerce aspect of this site was fairly straight forward because most of the products are consistent and have similar variable options. The business also charges a fixed shipping fee so the setup was minimal. As a result of this the cost of developing this web site was kept low.